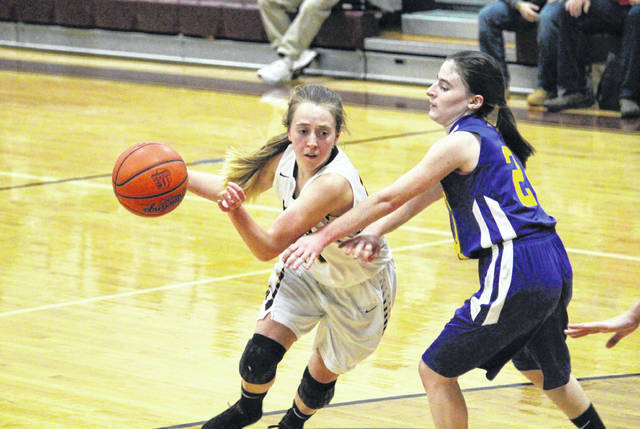 Meigs senior Madison Fields (left) drives past Southern freshman Brooke Crisp (right), during the Lady Marauders’ 90-24 victory on Monday in Rocksprings, Ohio. Southern freshman Kayla Evans (12) attempts a shot in the lane, during the Lady Tornadoes’ season-opening setback on Monday in Rocksprings, Ohio. ROCKSPRINGS, Ohio — These teams may not have much in common, but one thing they share, both will play in closer games this season. 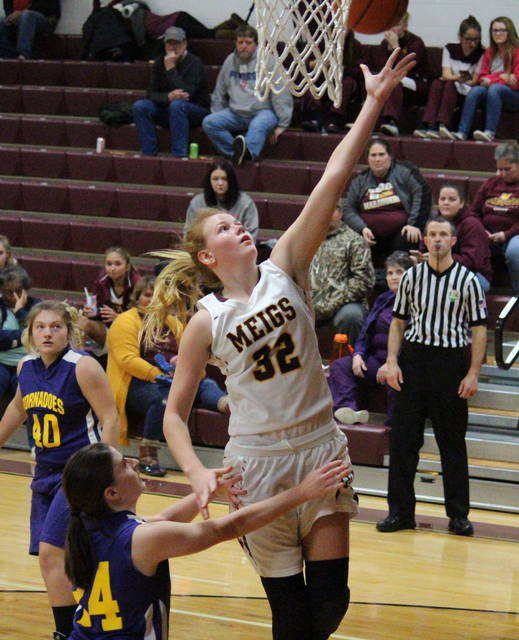 The Meigs and Southern girls opened up the 2018-19 season in a non-conference clash at Larry R. Morrison Gymnasium on Monday, with the experience-laden Lady Marauders rolling to a 90-24 victory over their in-county guest. Southern (0-1) — featuring just four returnees from last year’s team — led 3-0 on a Phoenix Cleland trifecta 43 seconds into play, but surrendered seven straight points to the Lady Marauders (1-0), who never relinquished the lead. Meigs — anchored by seven seniors as returning lettermen — led by as many as 18 points in the opening period, before Southern scored the final four points of the stanza to make the margin 23-9. The Maroon and Gold began the second period with a 29-0 run, featuring a dozen field goals. Southern ended the cold spell with eight seconds to go in the half, cutting the hosts’ advantage to 52-11. The teams traded three-pointers in the opening 1:30 of the second half, but Meigs scored the next 10 points and led 65-14 by the midway point of the quarter. The hosts ended the period on a 9-7 run, and headed into the finale with a 74-21 advantage. Southern was held to a trio of free throws in the finale, as Meigs cruised to the 90-24 victory with a 16-3 closing run. In the game, MHS shot 35-of-74 (47.3 percent) from the field, including 8-of-21 (38.1 percent) from beyond the arc. The Lady Marauders assisted on 19 of their 35 field goals, while shooting 12-of-21 (57.2 percent) from the free throw line. Southern connected on 7-of-27 (25.9 percent) of its field goal tries, including 3-of-9 (33.3 percent) three-point attempts. SHS assisted on six of its seven field goals, and was 7-of-22 (31.8 percent) from the free throw stripe. MHS earned a 35-to-26 rebounding edge, with a 14-to-5 advantage on the offensive end. Southern committed 43 turnovers, 29 coming on Lady Marauder steals, while MHS had a dozen turnovers, with just one steal by SHS. The Purple and Gold earned a 2-to-1 advantage in blocked shots. The Lady Marauders were led by senior Kassidy Betzing with 26 points, coming on 10 two-pointers, one triple and a 3-for-3 day at the free throw line. Betzing — who scored 19 of her game-high 26 before the half — also led the Lady Marauders with game-highs of eight rebounds and nine steals. MHS senior Becca Pullins hit three triples and three more two-pointers en route to 15 points for the victors. Lady Marauders freshman Mallory Hawley scored 13 points in her debut, while senior Alyssa Smith added nine points, with both players recording four assists to lead the Maroon and Gold. Madison Fields and Bre Lilly scored seven points apiece in the win, with Fields earning the team’s lone rejection. Olivia Haggy was next with five points, followed by Jerrica Smith with three. Kylee Blanks and Marissa Noble both contributed two points to the winning total, while Taylor Swartz chipped in with one. 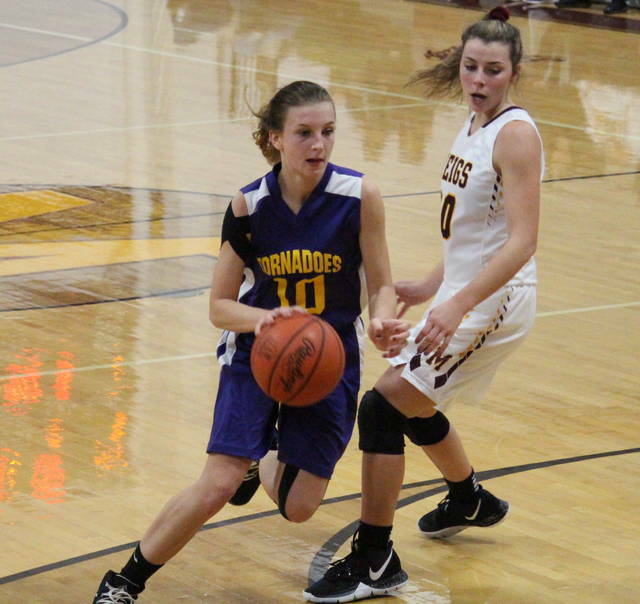 Phoenix Cleland led the Lady Tornadoes with nine markers, coming on a three-pointer, a two-pointer and a quartet of freebies. Jordan Hardwick made a pair of trifectas and a pair of free throws for eight points in the setback. Kelly Shaver, Jaiden Proffit and Kayla Evans added two points apiece for Southern, while Caelin Seth finished with one. Evans led SHS with team-highs of six rebounds and two assists. Brooke Crisp had the team’s lone steal, with Evans and Phoenix Cleland each recording a block. 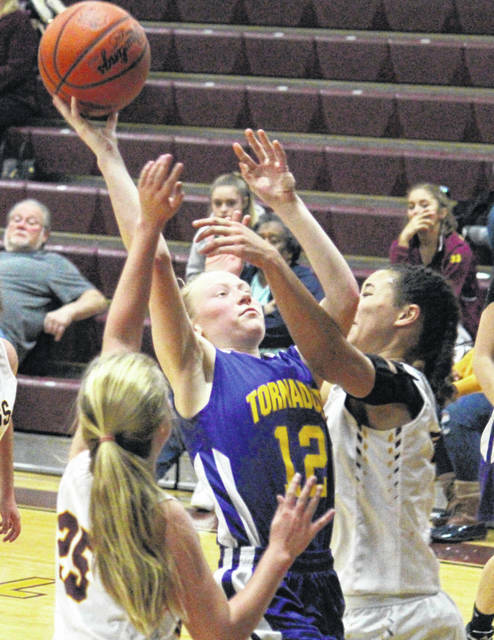 The Lady Tornadoes have now started three straight seasons at 0-1, with the Maroon and Gold winning its first game for the first time since 2016. Meigs has now defeated Southern in three straight chances, with the last Lady Tornado win in the series coming in the 2015-16 campaign. Both teams return to action on Thursday, with Meigs hosting Warren in a non-league tilt, and Southern opening up Tri-Valley Conference Hocking Division play at home against Federal Hocking.